(Dark Days) For years, a homeless community took root in a train tunnel beneath New York City, braving dangerous conditions and perpetual night. 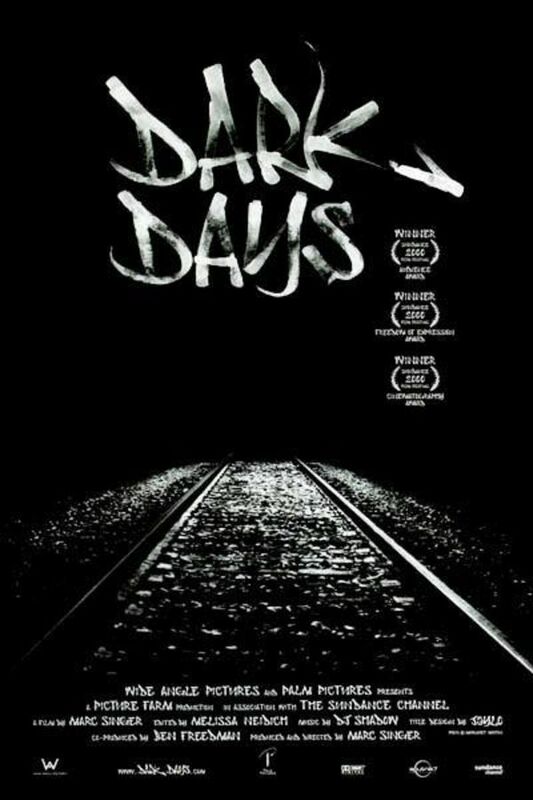 DARK DAYS explores this surprisingly domestic subterranean world, unearthing a way of life unimaginable to those above. Through stories simultaneously heartbreaking, hilarious, intimate, and off the cuff, tunnel dwellers reveal their reasons for taking refuge and their struggle to survive underground. Propelled by a soundtrack from DJ Shadow, DARK DAYS reveals a community that has thrived for years in the abandoned New York City underground. Very Riveting, makes you feel that nothing in this world is to hard to overcome. Moving! Reminds me to be thankful for the little I have! Prayers and best wishes to all on doc in wherever they are and their future endeavors landed them. Wow! Incredible that people actually live like that. Their stories are heartbreaking, and I wonder where they are today. Excellent documentary. Riveting. Left me wondering what course the Dark Days individuals took after the film was made. An excellent doc. The ending was almost too good to be true. If it was a "movie" I probably would not have believed the ending to be realistic. I would also like to know how these people coped after their resurrection. Nice work by the director to show the humanity of these people and to therefor suggest how large a role "luck" plays in our lives. Many people are born into circumstances beyond their control. Society should provide social supports to help the disadvantaged help themselves. Certain of our political parties try to help, the other, not at all.